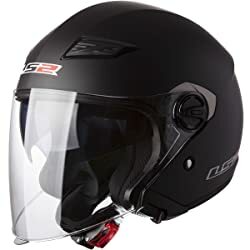 A motorcycle helmet is a protective headgear which is used by the motorcycle riders with an objective to protect their head during any kind of impact or a head injury. 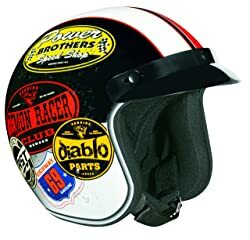 In case if you need a racer look while riding your bike, then the open face motorcycle helmets is surely your way to go. It will not just provide protection to your face but will also add to your grace and style while riding. When it comes to the safety on motorcycle what you wear on your head may be a matter of life or death for you. The open face helmet is not just safe but is stylish as well and carries a retro look that holds a great value of money for its users. As we all know that motorcyclists are at high risk during traffic crashes so an open face helmet provides them with the same rear protection that they may achieve with a full face helmet. However, it would offer little protection to their face even in the non-crash events. The effect of bugs, the wind or even dust to the face or eyes can cause rider discomfort or injury. Due to this, it is not uncommon that the riders would wear wrap-around sunglasses to supplement their eye protection with these helmets. One of the most important things that should be noted about this product is the fact that this is a half-face helmet. It is designed to leave a big part of the face open, which is also the concern for most people. Among other features, the lightweight composite shell is one that you might find to be impressive. The weight is significantly lesser compared to other helmets, which will make it comfortable. Also, since your face will be exposed, you won’t have to complain about getting hot. The muzzle that is integrated with the helmet is also an exceptional feature. The latter serves as the mask of the helmet. This will provide the protection that you will need from dust and will prevent such from getting into your mouth. The FidLock magnetic connection in the muzzle is also important, allowing you to easily wear it and take it off when needed. The interior is also ultra-comfortable. This is one of the reasons why it is the perfect companion even for long rides. It is soft on the inside, yet the shell is durable enough to offer durability that is hard to rival. The retro styling of this open-face motorcycle helmet is perhaps one of its best features. This is sure to be a head-turner when you are on the road. If you dare to be different and if you want a helmet that has a distinct character, this is what you should be wearing. Feature-wise, the custom fiberglass shell can be regarded as one of its best features. This material has been given positive feedbacks because it is lightweight. Plus, it is also exceptional when it comes to strength, guaranteeing the long-term functionality of the helmet. It is not only great from the outside but even from the inside. It comes with a custom-quilted liner. There is an EPS foam that serves as the comfortable cushion between the head and the shell. This will be highly instrumental of your highest level of comfort. Lastly, it comes with a five-year warranty from the manufacturer, which should be more than enough to provide you with peace of mind. Within such duration, you can return the helmet to the manufacturer if there are problems experienced. When looking for a motorcycle helmet, one of the most important considerations would be the material used, which will be indicative of durability. In the case of this model, it is made from Kinetic Polymer Alloy shell. Aside from being rigid, it also has gained a positive reputation for being exceptionally lightweight. The Twin Shield System Sun Shield is also a good feature in this helmet. The latter will provide you with versatility. You can use it to cover your face, and yet, you will have a clear vision. When the sun shield is raised, on the other hand, you will enjoy excellent ventilation. It is also a good thing that it comes with a plush comfort liner, which is breathable. 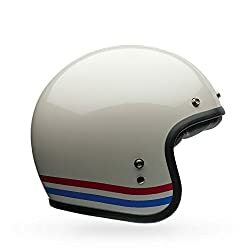 Nonetheless, because of the full-face construction of the helmet, a lot have noted that it can get quite hotter compared to those that are open. Lastly, the manufacturer is offering a warranty against defects that lasts for five years. This can provide you with the confidence that the product will indeed be long-lasting. Just be sure to follow the terms and conditions that they have specified. The shell of this motorcycle helmet is made from thermoplastic. The latter is one of the conventional materials used within the product category. It exhibits minimal weight, yet it is rigid enough to withstand a crash, and hence, offering the protection that is needed by the head. The snap-on visor is also an excellent feature of this product. The latter offers versatility as you can have it positioned in the helmet when you need to protect your eyes from dust and dirt. On the other hand, if you want the front of the helmet to remain open, you can easily take it off. It is also a good thing that it comes with a design that accepts communication system. You can have speakers integrated, depending on what is it that you are specifically using. However, there are some people who noted that it has the tendency to create a mushroom effect, which shows that it does not have a snug fit. This can be too big for some people, and hence, it can bounce on your head and will make you look like a mushroom. Among other things, the anti-microbial fabric is one of the most impressive in this product. With the latter, it will effectively wick away moisture, especially from your sweat. This is exceptional as it will deter the growth of the bacteria, making the helmet hygienic. The retro look of this helmet is also a plus. If you are looking for a distinctive style, this can be a good choice. the design from the outside looks like it has stickers on the surface. It also comes with a 3-snap visor. They are made from materials that can offer optimal clarity, while also protecting the eyes from dust and debris that can obstruct driving. Aside from the shorty visor, you will also have the option to use other visors that are compatible with this model. Lastly, the manufacturer is offering a one-year warranty for this helmet, which is pretty much the standards in the industry. It should be noted, however, that the warranty does not cover wear and tear, abuse, as well as any modifications that you might have made on the helmet. Safety should be your priority when riding a motorcycle. Accidents can happen and you might end up being heavily injured when you are not properly protected. At worst, this can even lead to death. 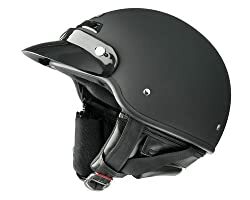 With this, one that you should have is a motorcycle helmet, which will protect the head from collision and injury. 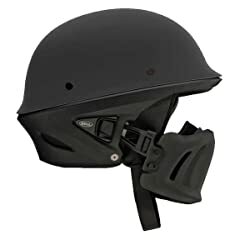 While there are many types of helmets that are available, one of the most popular is the open face. 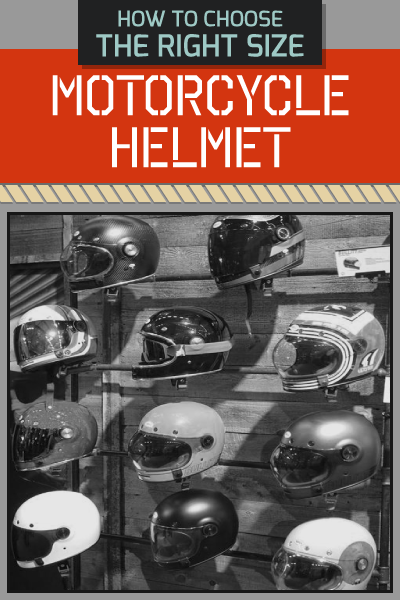 In the rest of this post, you will know what is an open face motorcycle helmet. Be armed with the right knowledge and in the end, you will realize that this is indeed a protective gear that you should have. Simply put, an open face motorcycle helmet is one that does not fully enclose the face. It covers a large portion of the head, but your face will be left exposed. Also called three-quarter helmet, it will protect the eyes, ear, neck, and head. Compared to a full-faced helmet, many people prefer an open face because it is more comfortable. With this, as you drive, you can feel the air directly hitting your face. It offers excellent ventilation, which is one of the things that you cannot enjoy if the helmet is closed. Some might be worried that an open-face helmet will not provide sufficient protection. Yes, this can be true, but only if you choose an inferior product. If you pick a high-quality open face helmet, on the other hand, you never have to worry about your safety. It must have a hard shell that will not easily break upon impact. It should also have an excellent enclosure system to ensure that the helmet will stay in its position if in case you fall off your motorbike. If you own a motorcycle, you should have a helmet as well. Depending on where you live, wearing a helmet will most probably be required by the law. More importantly, it is critical for your safety. It protects the head from serious damage in case of an accident. When choosing a helmet, you will be confronted with a wide array of options. One of the most common is an open-face helmet. Are you wondering when to use an open face helmet? Keep on reading the rest of this post and we’ll let you know. Among other situations, wearing an open face helmet is excellent during the summer months. If it is hot, this helmet is ideal because of the excellent ventilation that it can offer. Since your face will be left exposed, you can feel the air hitting your face as you drive. This minimizes the possibility of sweating. It is more comfortable compared to wearing a helmet that will enclose the entire face. Also, you should use an open face helmet if you want convenience when eating or drinking. With a traditional helmet that covers the entire face, you have to take it off when you have to take a bite from your food or sip your drink. If you have an open face helmet, on the other hand, there is no need to do so. Your mouth will not be covered by the helmet. Lastly, you should use an open face helmet if you are looking for better visibility. This will allow you to see clearly since your eyes will not be covered. If you are worried about dust getting in your eyes, on the other hand, you might want to wear sunglasses. 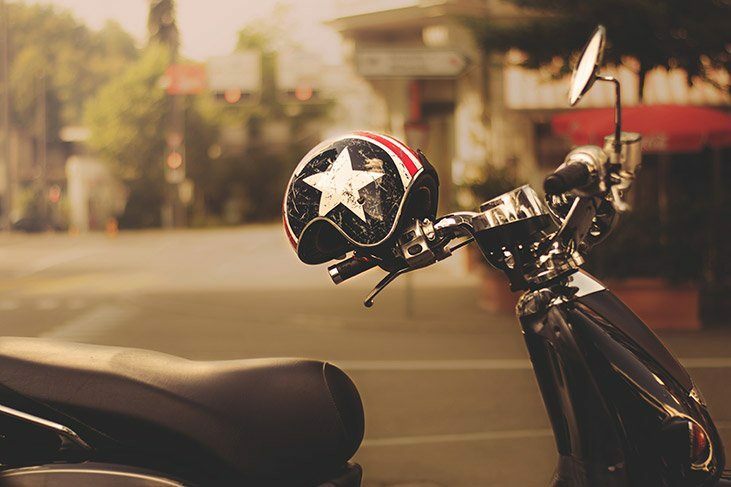 The motorcycle helmets greatly reduce the risk of injuries and fatalities during any kind of a motorcycle accident, so their correct selection is indeed a tough decision to be made by the motorcycle riders. But here, I sincerely hope that the knowledge I shared above,would surely be helpful for my fellow riders in making a wise selection to buy an open face motorcycle helmets for themselves.